We’d been talking for some time about adopting new cats. The house has been cat-free for the last 20 months or so, and it seemed empty. We debated adopting a dog instead: T. and I both grew up with dogs and love them, but dogs are a lot more work, and neither of us were sure of our ability to give a dog the time and energy it needs day in and day out. I’ve written before about my heartbreak — HERE and HERE at losing my Siamese cats, Buster and Chyna. They captured my heart so completely that when Buster grew too ill to go on I cried for days, and entered the worst bout of depression of my life. His sister Chyna’s passing less than three years later deepened the wound, and the thought of getting new cats was totally unappealing. I wouldn’t say those wounds have healed even now, but it’s time to give love and a home to cats who need both, so we went to Angel’s Wish and looked over what they had. Our original plan was to adopt a bonded pair of older cats. That proved to not work out so well; AW didn’t have any pairs of older cats on hand, so we settled for kittens. There were a number of bonded pairs, including at least one mom-kitten pairing, but the pair the caught our eyes, named Simon and Mallory, proved to be love bugs from the start. Simon is a classic tabby cat; Mallory is a Tortoise shell kitty. Their mother is apparently a feral, though these two are anything but, being delighted to have petting and playtime with people. At just under six months old, they weren’t super-young, but still very much kittens. Simon proved to be a very mellow kitten already, and moved directly to T’s lap after a short interval during our introduction. We prepared our bedroom to receive our new feline overlords, and brought them home the next day. 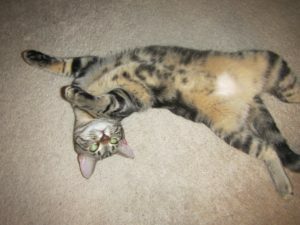 Monty – ready for belly rubs! Kittens DO spend a lot of their time sleeping. Unfortunately, most of that sleeping happens during the day, as I was reminded of during our first night with them. This was one of the reasons we had wanted adult cats originally; pity both our memories are so short for that sort of thing. We decided to change their names: Simon is now Monty, and Mallory is now Mina. Monty would answer to his old name, frequently coming when called, so that may take some time to stick. S-names are not good for cats: it sounds too much like hissing, and is a sound that, while good at grabbing their attention, also has strong negative connotations. Mina and Monty are sweet, affectionate, and playful. 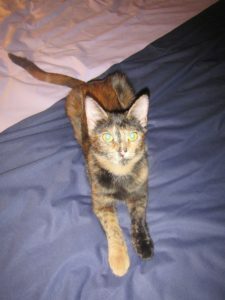 Like all kittens they have boundless energy, and Mina particularly loves sparkle-balls — little sponge balls in bright colors that look like tiny sea urchins, the “spines” being bring, thin strips of shiny foil. These two love attention and petting — especially belly rubs, which only very rarely become hand-traps. They already seem fairly well-behaved: they know all about the litter box, and have both used it successfully. They adore their new sissel-wrapped scratching post, though I did catch Mina clawing at the curtains briefly in the middle of the night, so we’ll see how long this honeymoon lasts. I have a feeling that, once they have the run of the whole house, these two will greet us at the door, just as Buster and Chyna used to for T when she came home from work. In any event, we now have two new kittens in the house: what remains to be seen is whether T and I will survive the experience. Congratulations!! They look adorable and just what your heart needs. Have fun and remember: there’s a reason they call them cat naps. You’ll need them! So glad for you, for Monty and for Mina!